Simulation games are conceptually an interesting thing to me. They often tackle the most mundane or realistic topics, trying to find fun in things that are usually considered work. Of course, they do this by knowing where to bend reality in order to make things more enjoyable. Extremely complex, chaotic elements are simplified into something slightly less complex and more predictable. Everything becomes tables of numbers and how they interact with each other, more often than not. Any why not? It’s fun, challenging, and satisfying to mentally disassemble these contraptions and become their master. And yet, the human condition is often covered by little more than a random number generator, severely underestimating just how much the whims of one person can swing the most carefully-laid plans. King of Dragon Pass ($9.99) is one of the few simulation games I’ve played that not only carefully considers that ever-present aspect of reality but embraces it, and its long-awaited follow-up, Six Ages ($9.99), doubles down on it. 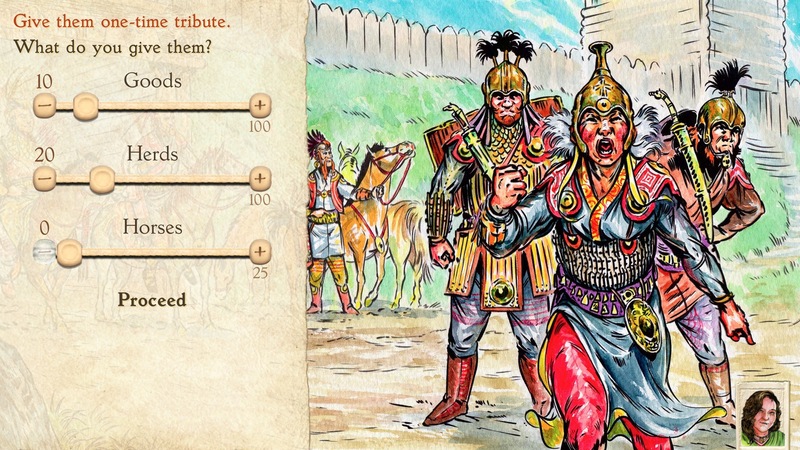 Like its predecessor, Six Ages is a simulation game set in Glorantha, a fantasy world created more than 40 years ago by Greg Stafford. Glorantha is famous and well-regarded for its careful attention to mythology and folklore. It’s as wondrous and detailed as any fantasy setting could be, but it does enough things its own way to make it feel distinct from the familiar tropes of the genre. Such a setting would be wasted if it were merely the window dressing of a typical 4X simulation game, but there’s little typical about King of Dragon Pass and Six Ages. These games seek to marry the numbers-focused gameplay of something like Civilization with a rich, unpredictable narrative full of choices, consequences, and random events. 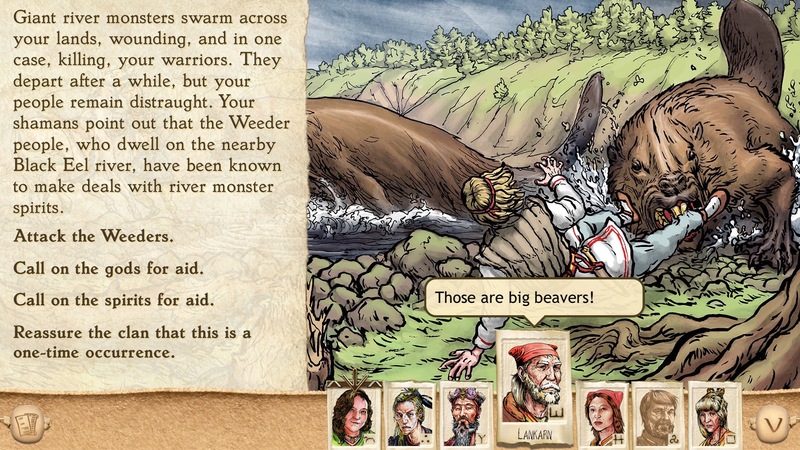 You’ll naturally need to manage resources, build defenses, negotiate with neighbors, and kill your enemies, but you’ll also need to deal with giant beaver attacks, discord within your own tribe, and visitors of questionable intentions. When these events occur, you’ll have to make a choice. You have a group of advisors who will weigh in if you ask them, but they almost never agree. Making this more complicated is that while you may be looking for the best choice, sometimes there isn’t one. Sometimes, they’re all good. Sometimes, they’re all bad. Sometimes, they’re just different. There could be immediate repercussions or far-reaching consequences you can’t even conceive of at the time you make your decision. Probably both. Whatever happens, it’s these unpredictable events that really separate Six Ages and its predecessor from their peers. The sheer number of possible events the game includes means that you can look forward to numerous playthroughs of Six Ages with very little repetition. Each event is accompanied by some lovely full-color artwork, and the writing manages to be both informative and entertaining. The simulation side of things is no slouch, either. There are lots of things you need to take care of in order to keep your people safe and prosperous. There has to be enough food, enough space, houses for everyone, a decent standing army for offensives, fortifications for when you get attacked, and the occasional literal sacrifice in order to curry the favor of one of the many gods or goddesses. You have to handle relations with other tribes, be they friend, foe, or mere trading partner. Should you bring a gift? How big should it be? It’s up to you, but do keep in mind that you don’t win friends with salad. You’ll have to embark on quests to re-enact legends, striving to be as accurate as possible. That means you yourself will have to dig into the game’s lore to familiarize yourself with those legends. And if anything fails you in all of these tasks, you can always try a little magic to see if it gets you by. So yes, it’s a bit of an odd mash-up we have here. 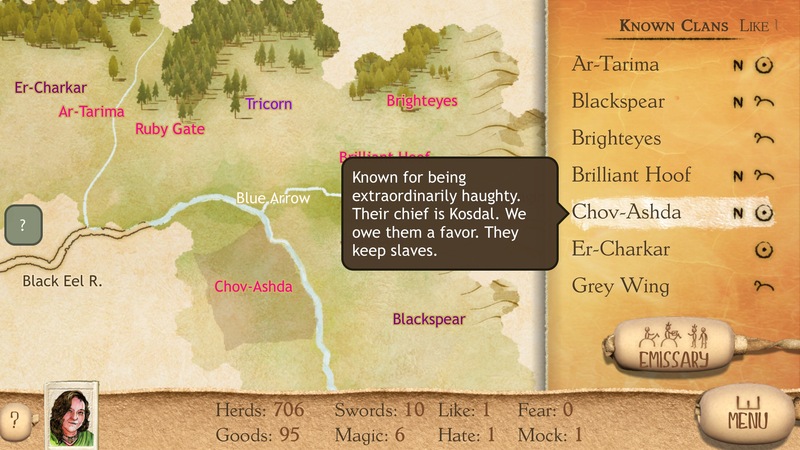 Certainly, if you’ve played King of Dragon Pass, nothing here will sound all that unfamiliar. And it’s not. There are changes here, streamlined things there, and you can tell this was designed for mobile first in a way the previous game wasn’t, but all of the broad strokes and quite a few of the finer ones are the same. It’s basically a new scenario, literally hundreds of new events, and a few small refinements. If you loved the first game, you’re going to love this one, too. If you bounced off the first game, you probably won’t fare any better with Six Ages. That said, I do feel like the tutorial is a little better at explaining the mechanics in this game, so you’re not thrown totally in the deep end if you don’t know what you’re doing. The truth is that Six Ages, like King of Dragon Pass before it, is a niche game that a lot of people are not going to be able to get a handle on. But if you do, you’ll likely play it for years. I know people who have been playing the first game for the better part of two decades, and they’ve only just put it down because this follow-up finally arrived. I’m not quite as obsessed with either game, but I regularly came back around to the first game to do another playthrough after my initial love affair with it, and I imagine I’ll be doing the same here. But as to whether any given person will like the game or not, I can only say that it’s a very high-quality game in both of the genres it plants its feet in. You can’t hate either of those genres, though, or it’s just not going to be something you can get into. The turn-based strategy simulation part of the game and the choice-based narrative part walk hand-in-hand, and you’re not going to be able to separate them if you don’t care for one of the pair. If you’re okay with both of those genres, however, you’re very likely to fall in love with Six Ages. 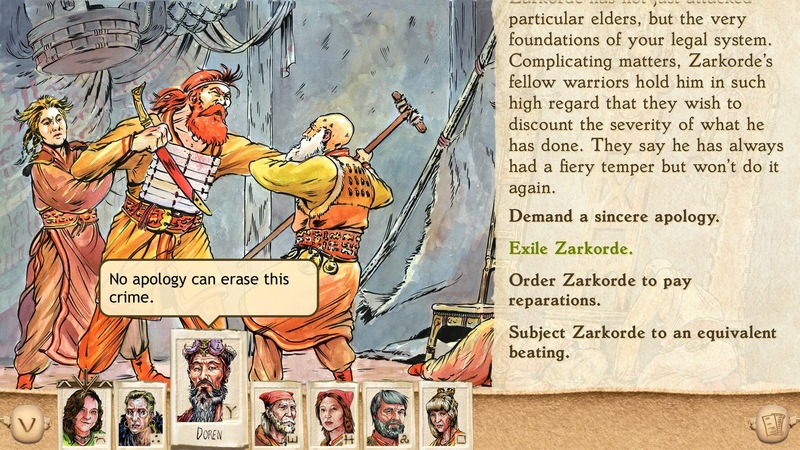 It’s probably no surprise to anyone who played the preceding game, but Six Ages is absolutely incredible. You never know what’s going to happen next, but you have enough control to steer around anything if you’re clever enough. It pokes at so many parts of your brain that it’s simultaneously demanding and relaxing. About the worst thing I could say about Six Ages is that it’s content to stay pretty near to what was established in King of Dragon Pass. I don’t know that anyone would have been looking for some dramatic upheaval, but if you were, I guess you’re going home with hat in hand. Ultimately, it’s more King of Dragon Pass. If you’re willing to put a little time into it and don’t mind that it can be terribly opaque and randomly cruel at times, you’re going to get an absurd amount of enjoyment out of it. If your eyes start to glaze over at the thought of trying to balance food supplies with regular sacrifices to gods, the sim side is probably going to turn you off. If you’re not a fan of reading or absolutely hate having wrenches randomly thrown at your head while you’re trying to play chess, the narrative side may irritate you. But if you want to get lost in a world full of meticulous details and gameplay that isn’t quite like anything else, you’ll want to hop on to Six Ages as soon as possible.